You’ve designed a cutting-edge fashion item, and you’re aiming to manufacture in China. How do you do this? You’ve designed a cutting-edge fashion item or a full collection, and you’re aiming to manufacture in China. What are the steps needed to go about this? You might need to register your brand to protect it against copying, and you’ll also need to draw up a contract with your manufacturer and distributor outlining clear details on how you plan to work together. All this may or may not be as straightforward as you think. This Own-It event will provide information on how to find out about support for UK businesses that are planning to manufacture in China, and what look out for to avoid infringements and to make sure everything’s above board. Come and celebrate Chinese New Year with refreshments and networking from 8pm. Naazneen Schmittzehe will be using her experience as a solicitor in both the UK and Hong Kong to advise you on the steps you should be taking to protect your work as you move forward in manufacture. Colin Allaway, from the Manufacturing Advisory Service (MAS) is the London resident expert on China and has first hand experience of sourcing and trading in the Far East. Colin will be discussing some of the considerations that fashion designers should take into account. 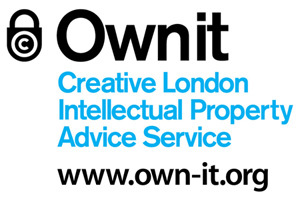 Own It provides free advice, resources and events on intellectual property, including copyright, design rights, trade marks, patents, branding, licensing, royalties and contracts. Membership is free and members can attend events, download event podcasts, sample legal contracts, access legal advice and attend IP clinics (free 45 mins with IP lawyer). Visit www.own-it.org for more information. You must register on the Own It website to reserve a place.